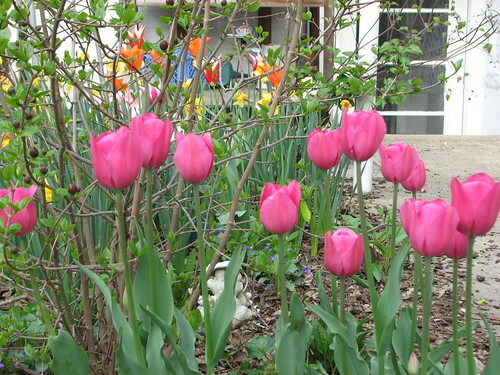 (l) The species tulips in the garage garden are still going strong! 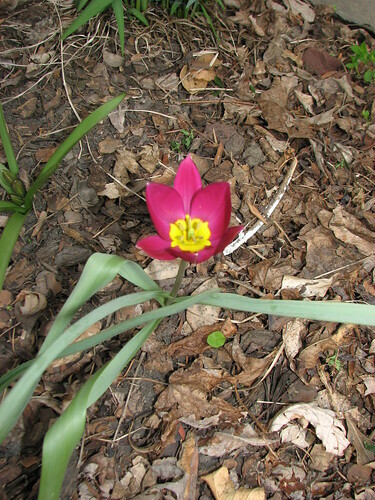 (r) The newly planted species tulips in the front yard are more spindly than I expected, but I love the color. 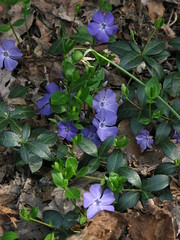 (l) Vinca minor, which I've tried without success to eradicate. 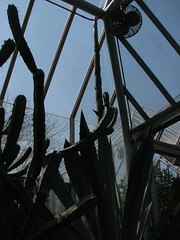 Left to its own devices, it will eventually choke the entire garden. 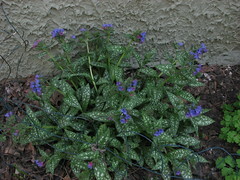 (r) Pulmonaria 'Trevi Fountain', one of my favorite plants; semi-evergreen, purple flowers, variegated leaves, thrives in shade; what's not to love? 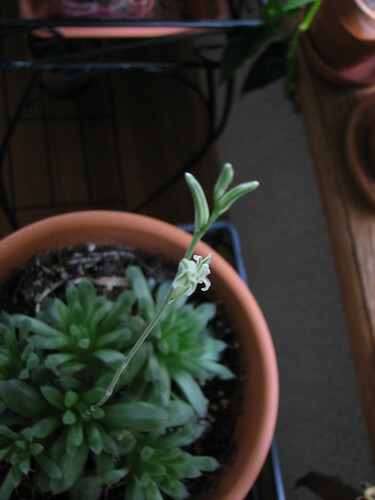 And back in the house, both of my Haworthias are blooming. This one is Haworthia cooperi. 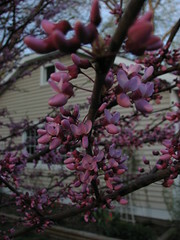 What else is blooming today? 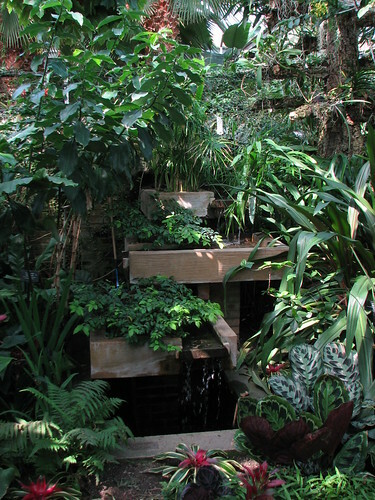 Visit Carol at May Dreams Gardens to see! 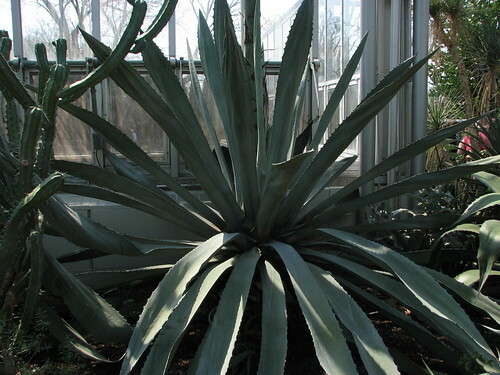 The Garden's Century Plant is beginning to bloom. Hybrid tulips can be such a letdown. In their first year they are a stunning explosion of shapes and colors; the next year, only a few come up, and they're smaller and less brightly colored. 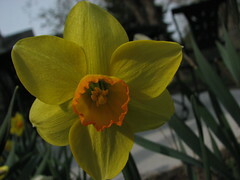 I vow never to fall for them again, favoring more reliable perennial bulbs like daffodils and crocuses, but then the fall bulb sales arrive and I find myself getting suckered. It's especially strange because I don't even like hybrid tulip flowers that much. I am a victim of marketing, I confess. 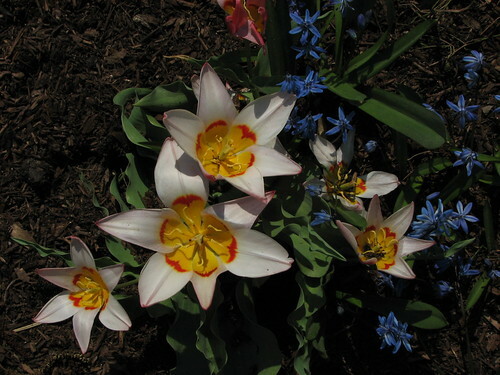 However, species tulips are consistently wonderful! 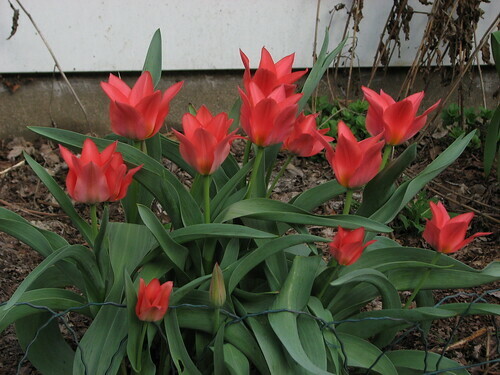 I don't know what accident led me to planting them years ago, before I knew the first thing about tulips, but the four clumps in my garage garden bloom and multiply reliably year after year and make me look like a tulip expert. 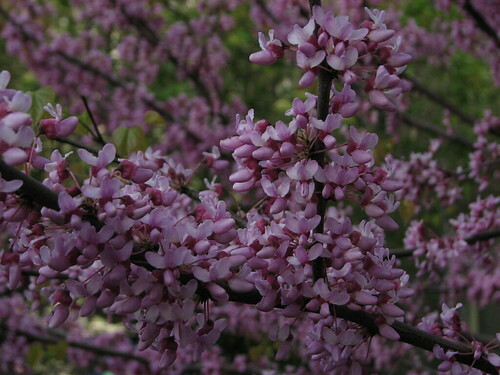 The buds stay tightly closed at night and on cloudy days, but when touched by the sun they pop open in a star shape to display their pretty black markings. 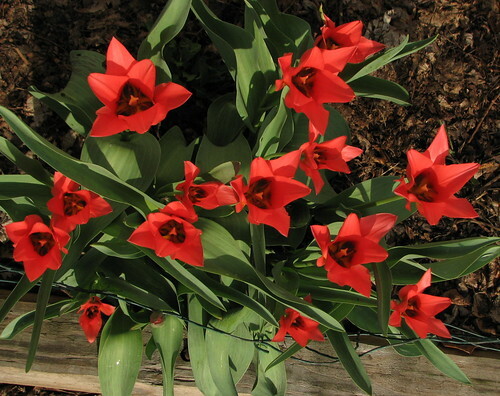 There are several species of tulip; I'm not sure what mine are but Tulipa praestans is a possibility. 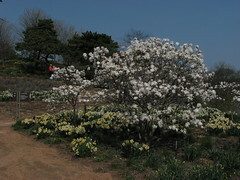 Species tulips (article from Flower and Garden Magazine, Oct. 1993) are descended from the wild tulips of the Mediterranean and Asia. 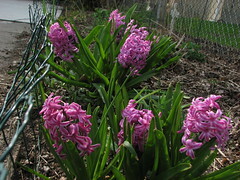 They tend to be smaller and earlier-flowering than the more familiar hybrids, and they naturalize well. Non-species tulips are a good example of the downside of artificial selection; selecting for traits like rounded bud shape or exotic color or height can lead to negative consequences for other traits like longevity. 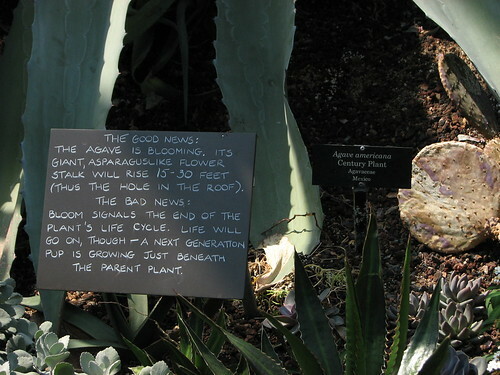 Not to mention the downsides of hybridization, including sterility and hybrid depression (though hybrid vigor is also possible, or some parts of the genome can be depressed while others are vigorous!). I find my little species tulips much cuter than hybrids, and I love them for sticking around for so many years. Last fall I ordered more from American Meadows and planted them in the front garden. 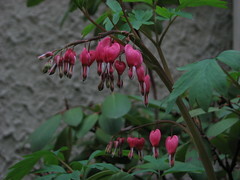 They are not as far along but I have high hopes for them; they should be blooming in a few days. I am excited to be participating in the GROW project this year with many other bloggers! 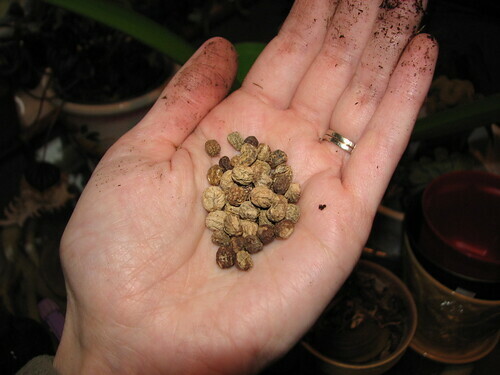 The seeds were generously provided by Renee's Garden; the selected plant is the 'Spitfire' climbing nasturtium. I've never grown nasturtiums before and I rarely grow anything from seed because spring also is my busiest time with work/school obligations. Still, surely I can keep a few seedlings alive and healthy this year! I have been gardening at this house for 15 years now but wintersowing is still an entirely new concept to me. Thanks to Monica and Kylee, I think I now have the basics down, and the GROW project is a perfect place to try it out. 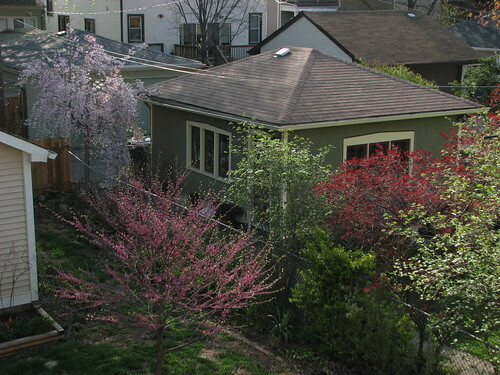 I started pretty late; I planted on March 13 when it was in the 50s and hardly "winter" in Chicago anymore. Still, the nights get cold and I fully expected more snow and bitter cold (and I was right!). I washed a gallon milk jug, cut it in half, and punched holes in the bottom with an awl. 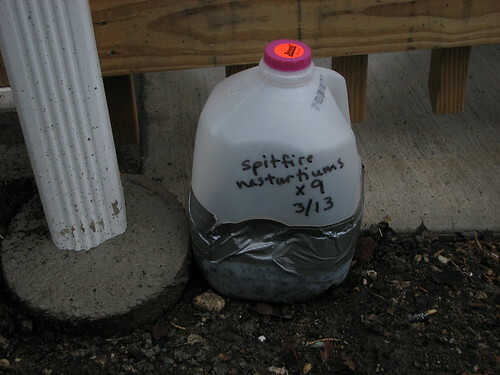 I then filled it with about two inches of potting soil. I use Miracle Grow potting mix with some perlite mixed in, and moisten it well in a bucket. 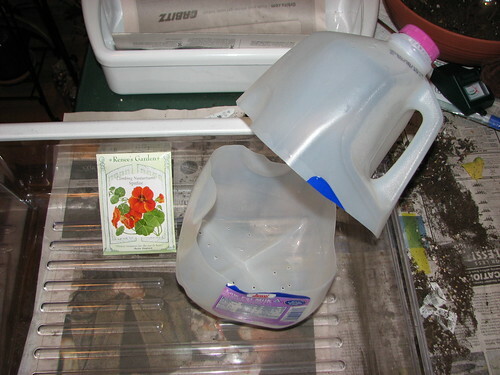 I planted nine nasturtium seeds to a depth of an inch, covered the seeds, sealed the jug with duct tape, labeled it and set it outside. 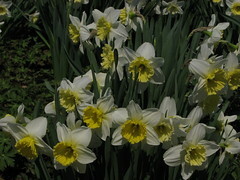 I have lots of seeds left over, and some of those will be planted directly in the garden after the last-frost date of May 15. 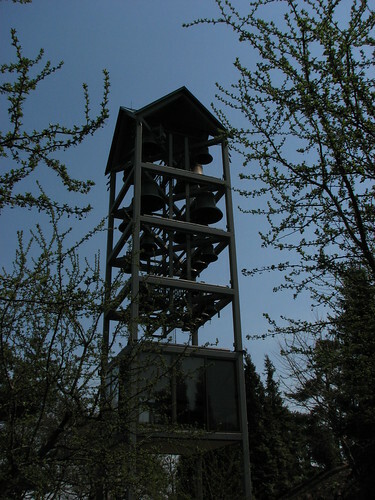 As of April 1, no sign of seedlings yet.